All Year Cooling, a local air conditioning repair and maintenance company, will be raffling off two tickets to the 2017 Jingle Ball. This offer is exclusive to the Cool Cash Rewards Club members. South Florida HVAC company, All Year Cooling, announces its November Cool Cash Rewards Club prize raffle. Each month, All Year Cooling offers an exclusive monthly raffle open to its members only. 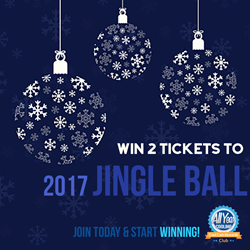 This November, the company is offering a prize of two tickets to the 2017 Jingle Ball at the BB&T Center in Sunrise, FL. The performance will take place on Dec. 17 at 7:30 p.m.
For the third year in a row, iHeartMedia will partner with Capital One to present the annual iHeartRadio Jingle Ball Tour with a 12-date trek that runs through late November into mid-December. The Jingle Ball tours many states throughout the country from California to Florida. The featured artists for the concert taking place on Dec. 17 include Demi Lovato, Nick Jonas, Charlie Puth, Zedd and many more. Automatic entry into a monthly raffle is one of the benefits of All Year Cooling's Cool Cash Rewards Club. Club members also get the chance to take part in giveaways and take advantage of exclusive offers. Referrals grant members added entries for the monthly raffle, which includes prizes for sports fans, theater enthusiasts, travelers, and more. To become a member of this club, All Year Cooling customers have to sign up and then refer friends and family. For each installation referral, members get a $100 cash gift card. All Year Cooling has given away more than $10,000 in referral cash and prizes, demonstrating its value for positive feedback and referrals that its customers offer. Since 1973, All Year Cooling has provided professional HVAC services for homeowners in South Florida. Located in Fort Lauderdale, this family-owned business specializes in air conditioning installation, maintenance, and repair. The company also offers ductwork services. All Year Cooling has installed more than 200,000 air conditioning units during its close to 45 years in business, and the company maintains an "A+" rating with the Better Business Bureau. The company services cooling systems from Homestead to Vero Beach, Florida, and it prioritizes customer service. Customers can call, text, or email Smith directly to offer feedback or get answers to their questions.